I arrived at the dog town on August 10, 2017, at 2:32 p.m. and fiddled around getting all my junk into the Schwinn cart, hanging sheets over the passenger and driver’s side windows, and at 3:09 I was off to the hunt. As I came up out of the creek bottom I had to cross, I spotted a prairie dog off to the SW. I parked the Schwinn cart and begin sneaking up to the edge of the creek bank. When I got to where I could see, the prairie dog had disappeared. 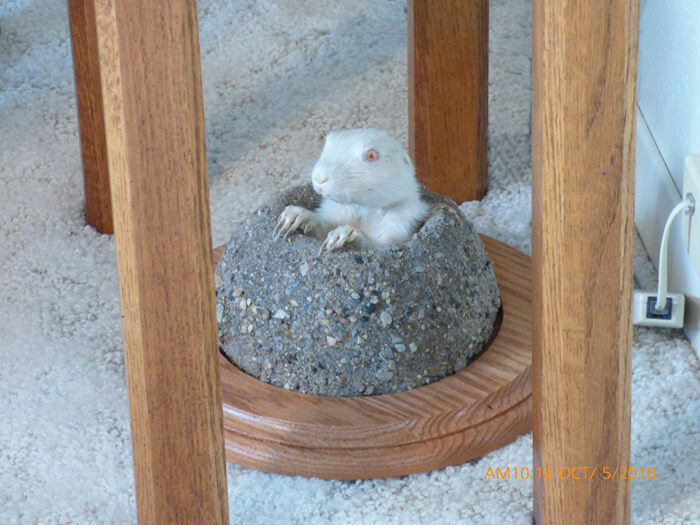 At 3:14 p.m., I scanned to the south and there to my amazement was an albino prairie dog!!! I wanted to bag one of these albino PDs but when my bullet hits PDs they pretty much turn them inside out. The albino PD was standing up and I aimed to hit him low. I squeezed off the shot and could see lots of PD parts flying. I hurried up to the albino PD and his bottom half was pretty much disintegrated, but his chest, two front legs and head were intact. I’ll see if my taxidermist can do a mount where the PD has just his head and front legs sticking out of the PD hole. I had a couple of plastic bags along and placed the mangled bottom half in a small bag and sealed it as best I could and put that and the rest of him into a bigger bag and sealed it tight. Here’s a photo of the albino in his bag. He has pink eyes, but he’s fast asleep in these photos. I hiked back to my pickup and place the packaged albino PD into one of my ice chests. I went back out into the PD town searching for my lost camo bean bag which I eventually found!!! The bottom half of this prairie dog was totally disintegrated so Frenchy had to figure out a way to mount the little fellow sans his bottom half. 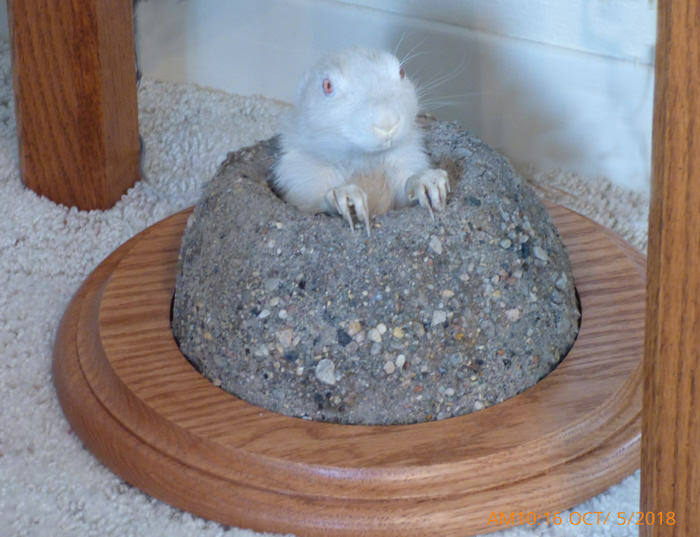 He decided that the only way to preserve this prairie dog was to freeze dry him so that’s what he did. I think it turned out quite well. My wife doesn’t like to have antlers on the walls of the living room, nor does she like to have tanned pelts hanging there either so where could I display this mount? 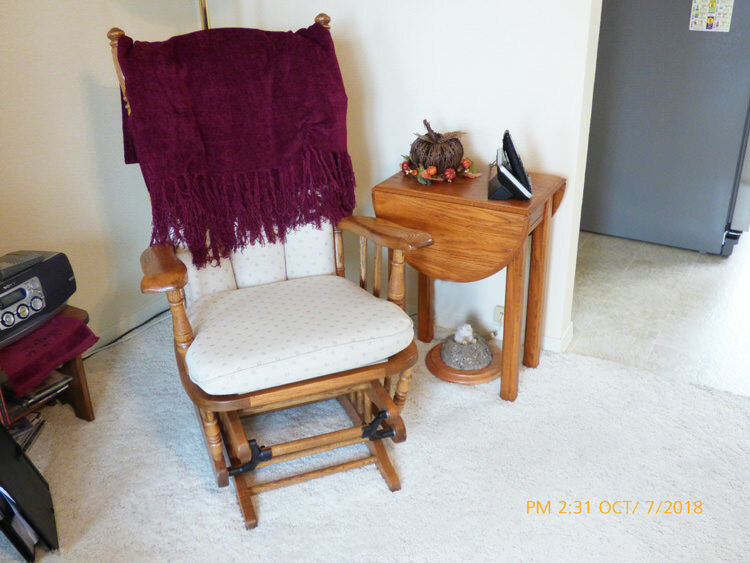 I placed in over in front of a corner china cabinet in the southwest corner of the living room. This morning she asked me to comment on where she had place the mount. I looked around and couldn’t see it. She pointed to the area where we have a land line phone sitting on a nice oak stand and there was the prairie dog mount under that table. What do you think about the mount and the spot my wife selected for displaying the mount? She said she wouldn’t mind having it there permanently!!!! Super - And ground level makes a lot of sense. That's the best PD mount ever!! Here's a photo showing where the little albino PD is hiding. Hope no one gets scared!! !